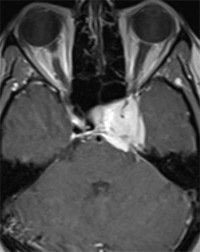 A 39-year-old woman presented with left third nerve palsy. Axial and coronal T1-weighted images after contrast injection showed an intensely enhancing lesion in the left cavernous sinus encasing the intracavernous portion of the left internal carotid artery (compared with the right normal side). This lesion causes cerebellar tentorial thickening (Figures A and B). A small ipsilateral dural tail can be seen (Figures B and C). The lesion extends to the right cavernous sinus as well as to the left superior orbital fissure (Figure B). Meningiomas are the most common primary nonglial intracranial tumors. They mostly affect people in middle age and older, with a 2:1 female dominance. Typical meningiomas are homogeneous, broad based, and markedly enhancing extra-axial lesions that are firmly attached to the adjacent dura mater. 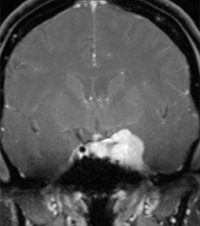 Approximately 50% of meningiomas are parasagittal or attached to the sagittal sinus. Unusual imaging features such as cysts, ring enhancement, or fatty transformation occasionally are seen. The distinguishing characteristic of cavernous sinus meningioma is its predilection to encase the carotid artery, causing stenosis. The main treatment of meningioma is surgical resection. Radiation therapy may be used in cases when surgery isn’t feasible. — Pedram Parva, MD, is an attending diagnostic radiologist at the Boston University School of Medicine and the VA Healthcare System in Boston as well as an instructor at Harvard Medical School. Shaman MA, Zak IT, Kupsky WJ. Best cases from the AFIP: involuted sclerotic meningioma. RadioGraphics. 2003;23(3):785-789. Buetow MP, Buetow PC, Smirniotopoulos JG. Typical, atypical, and misleading features in meningioma. RadioGraphics.1991;11(6):1087-1106. 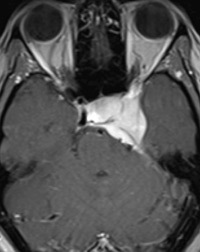 Bag AK, Shah R. AJR teaching file: cavernous sinus mass in a woman presenting with painful ophthalmoplegia. AJR Am J Roentgenol. 2010;195(3 Suppl):WS1-WS4. Cases should have clinical relevance and clear radiological findings. Seconds should include a title, history and course of illness, findings, diagnosis, and discussion. Word count should not exceed 800. At least three references are recommended. Cases may be submitted from any radiological subspecialty and imaging modality. Figures must be high-quality JPEG or TIFF images and labeled for ease of reference. Please keep images in their native format, without the addition of arrows or other means of highlighting the key findings. Submit cases via e-mail to Rahul V. Pawar, MD, at rvp325@gmail.com or to Radiology Today at jknaub@gvpub.com. Copyright © 2014 Great Valley Publishing Company Inc., Publisher of Radiology Today. All rights reserved.